I can’t answer that but what I can answer is, how much does that cone weight empty? I started to keep a spreadsheet on how much the empty cones weight and the dimensions of the cone and I thought I'd share my data with you. I have found that Brassards from Plessisville, Quebec Canada uses the same tube for most of their 8 oz products – Average Weight is 0.40 oz. Webs in Easthampton MA, USA is another supplier that we use. The 1 lb cones that they use are different sizes and shapes but I use this weight for a rough idea. 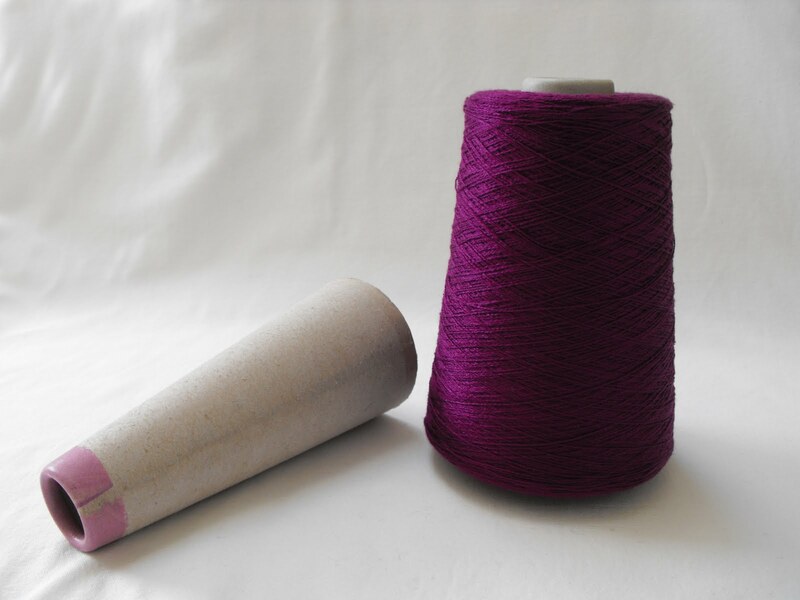 Sometimes weavers pick up cones and tubes from Guild Sales and you don’t know where they are from but maybe knowing the dimensions of the tube you can use these mystery cones as a reference. I hope that this information helps you I know it helps me. I took my three gold Huck Lace Runners off the loom just after Christmas, and then they languished. I just couldn’t find the time to get to them. Finally, I cut them apart, machine finished the ends with a few lines of zigzag stitching and waited for a clear day to wash them. And waited, and waited, it felt like we had rain every day for weeks. I need a clear day so that I can use racks to flat dry the runners and having them dry outside is preferable. Living on an island on the ‘Raincoast’ means high humidity and I could not bear to add more damp to the house! I finally gave in and set the racks up in the garage and laid out the runners, three gold ones for me and 2 rosy brick for Ngaire ~ a true plethora of runners. Ngaire and I often share the work load on runners and tea towels, so she got out ‘McSteamy’ our steam press and gave them all a first run through. This photo was taken in our old house and darned if I don't still miss the sunny, dry Okanagan Valley. After the quick press Ngaire pinned up the hems on all five runners. We had a lovely sunny day a couple of days ago, so sitting by the fire in the bright sunshine, which shows the runner colour up beautifully, I hand hemmed the lot. What a feeling of success. 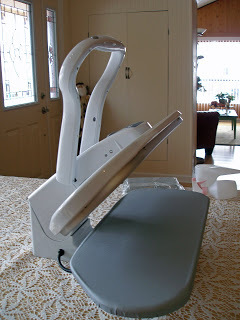 As I was hemming I thought about this blog post and decided I would share the a few thoughts on hemming table linens. 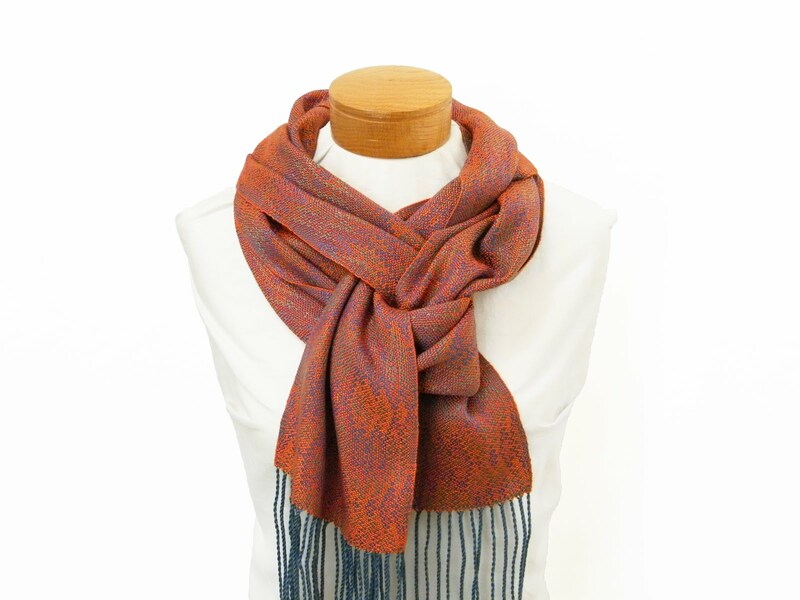 If you are weaving a runner with a pattern you should leave some ‘plain’ weave for the hem. In this case since the runners were Huck, I was able to use tabby weave for the hems, but if I was weaving a fancy twill runner I would weave the runner in 1-2-3-4 straight twill. I think that hems should be generous looking and be in balance with the length of the runner, in this case I wove 5 inches of plain weave, 1-1/2 inches for the fold under, 1-1/2 inches for the reverse side of the runner and 1-1/2 inches for the border on the front of the runner before the pattern begins. The final 1/2 inch is for shrinkage and cutting off the machine zig-zagging I did to hold the fabric while I washed it. After I have chosen a sewing thread in a matching colour for the runner I pass it through a product called Thread Heaven that my friend Susan at Thrums gave me. This is a thread conditioner and it prevents the thread from fraying, tangling and twisting upon itself when you are sewing. A really great product that makes the whole job easier. I never, never, never use spit to wet the sewing thread when I thread the needle. If you are selling the finished product, your customer deserves to have it arrive without your DNA! Use sharp scissors to give you a clean cut and big-eyed needles to help you find the eye if necessary. I prefer not to use a knot in the sewing thread to anchor and begin the hemming. Rather than a knot I start in an inconspicuous place on the hemline and do a few running anchor stitches and then carry on from that point; I finish in the same manner leaving an inch or so of thread tail within the hem. Knots can squirm through the fabric over time and pop through. I always sew the side portion of the seam closed, this ensures that any raw edges are well protected inside the hem and I use ‘invisible’ running stitches to sew the hem. After all the hemming is done it only needs a good heavy steam press is the final finishing touch, this runner still needs the Huck Lace areas tamed, still quite a bit bubbling in the plain weave diamonds! The final length of the runners are #1 - 66 inches, #2 - 56 inches and #3 - 36 1/2 inches. The garden shot today is of Campanula carpatica 'Clips Deep Blue' commonly called a Bellflower, just beginning to show leaves, hidden under last years flower stalks. 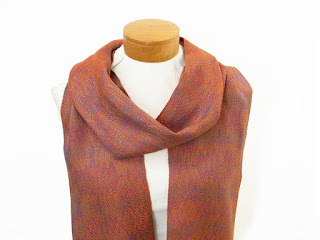 Mum wove a scarf in August that I just loved; it was an Echo Crackle in orange with blue and green for the warp. It unfortunately had some errors and now it is hers. I loved how the colours interacted in the finished weave; so I put on a warp with the same colours of blue and green. In the warp photo the colours have pooled to make a stripy warp but in the threading the colours have been separated to blue, green, blue, green etc. 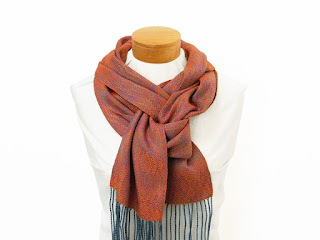 The threading is the same as Mum’s cayenne red scarf which she hasn’t blogged about yet! The threading is an Echo weave so it is a parallel twill threading. For my scarf the treadling is very different. I used one of my original crackle treadling’s, from the lime green and navy crackle diamond runners. It is amazing how different it looks now! The pattern repeat is 6 inches long and gives two different large motifs almost stacked over each other. The iridescence of this scarf is truly amazing. The blue, green and orange mix together and make a violet colour which is so interesting and beguiling. As always the drape and movement of Tencel is just stunning. For Sale. The garden shot today is of crocus's just popping up in the garden. I marked each patch of bulbs with ceramic mushrooms so that I remembered where I put them. Nothing worse than digging a hole to plant something and finding a bunch of bulbs already there. Here are the projects that are on the looms. First with Mum’s loom, she has a 12 yard warp of tea towels on the loom. The warp is navy 2/8 cotton and she has just started the first tea towel in peacock blue. The pattern is a lovely twelve shaft twill pattern. On my loom is nothing. I have just cut off two pretty red lace runners. Now I am starting to plan my next project. I have two cones of 2/16 blue mercerized cotton that I am hoping will become a lace runner. Final Garden shot is of the hinoki cedars ( Chamaecyparis obtusa 'Nana Gracillis") wearing their winter hats. They need some help to stop the heavy coastal snow from bending and splitting the branches.